You may not realize it, but Boba tea costume ideas are the hottest thing in girls’ costumes this Halloween. And really, with how cute those little drinks are, it’s no wonder someone came up with the idea! So when your little girl comes home from school and says she wants to be Boba tea, don’t be surprised. Instead, be prepared with some adorable Boba tea costume ideas! Hey Moms, just for kicks, get into the fun of a Boba tea costume with this cute t-shirt available at Amazon. This is definitely my idea of a costume! It’s actually available in men’s, women’s and youth sizes. So if the whole family likes Boba tea…. The most important part of a Boba tea costume is replicating the black tapioca pearls piled in the bottom of the cup of every delicious Boba Tea drink. The easiest way to do this is probably with round black balloons. You can get a supply of small round black balloons at Dollar Tree. A 15-count pack is, you guessed it, only a dollar! Another creative way to replicate the Boba tea pearls is with black Pom-Poms. Try these 2-inch size Pom-Poms available at Michaels. These can be attached to the bottom of the costume pretty easily with fabric glue or a hot glue gun. For a cute Boba tea costume, you’ll need to acquire some cardboard to make the Boba straw. A cardboard cylinder like you get from the middle of a roll of wrapping paper would be perfect! Paint the outside in a fun Boba tea straw color, such as pastel pink. The Boba straw can be made into a headband so that your girl becomes part of the Boba Tea drink. 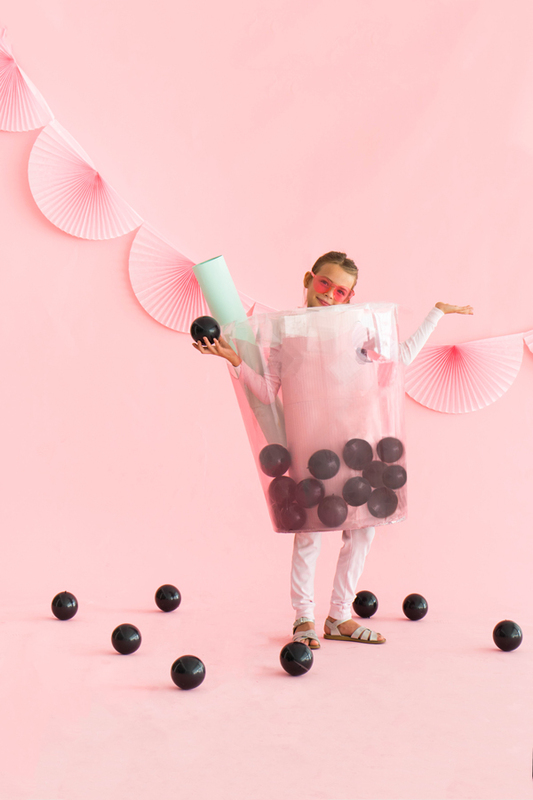 For some cute Boba tea costume idea inspiration, check out the DIY costume at Oh Happy Day. They make it look really easy!Another adorable idea comes from Aww Sam. The Boba tea “dress” could easily be modified for a girl. No matter how you put together your own girls’ Boba tea costume, it’s sure to be a hit in this year’s school parade!